If you're from Edmond, Okla., like me, chances are good you may have a Shannon Miller story or two from her years growing up and meeting the world from right there in the Sooner State. For many, introductions to the gymnastics champion took place during U.S. Olympic Festival '89, the U.S. Olympic Committee's version of the Games held in non-Olympiad years from 1978 to 1995. For 10 days that July, Oklahoma City was in the spotlight, and Miller was one of the hometown favorites, a pre-teen with some international training under her belt. By the time Miller made her first Olympic team in 1992, I was acquainted with her mother via a few Olympic pin trades. And when Edmond's own Olympian returned from Barcelona with five medals, it was fun to volunteer as the town threw her a massive parade, presented a key to the city, and gave her a set of keys to a new car Miller was not yet licensed to drive. 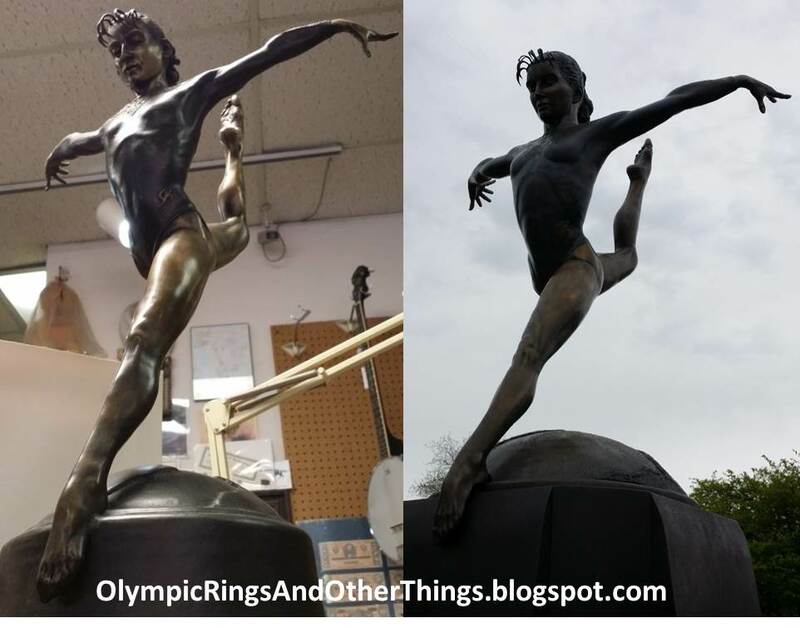 These and many other small town memories -- and her many remarkable gymnastics feats -- are detailed in Miller's words on the pages of her recently published autobiography "It's Not About Perfect" now available from Thomas Dunne Books. A few book tour stops remain scheduled this summer. A review of the book follows after a few more paragraphs of my own Shannon Miller memories. Though we shook hands once as Miller signed autographs for Atlanta Committee for the Olympics Games (ACOG) staff during spring 1996, and though I cheered for her with the rest of America when the Magnificent Seven won gold in the Georgia Dome, after the Centennial Games there were fewer occasions when Miller gained attention. The main reminders arrived when driving back into Edmond, where there are billboard-sized signs celebrating the hometown hero, and a section of Interstate I-35 is officially named the "Shannon Miller Parkway." The city also installed a massive bronze sculpture of Miller atop a balance beam/globe in a park beside the Edmond Public Library, another occasional reminder, but only while visiting family there. It took 16 years before Miller and I spoke for the second time at USA House in London. I'm embarrassed to admit that during the conversation with Miller and her husband, I had no idea she survived cancer (!!!) nor did I realize she was reporting from the Games as a gymnastics commentator. So when the new book publicity team scheduled a phone interview and provided a review copy in April, I was thankful for the opportunity to inquire more about Miller's post-Olympics life now centered in Jacksonville, Fla. It took a few weeks to finish, but I enjoyed reading Miller's autobiography after that conversation from the parking lot of the Edmond Starbucks. By phone, Miller explained her aspirations for what readers may gain from 'It's Not About Perfect." "No matter what [one's] struggle is, I hope readers will take a nugget or lesson and find they are not alone," said Miller, who added that the book writing process was "therapeutic" and "cathartic" on many fronts. "Growing up, I did not stop to smell the roses along the way, and this 'real' book was fun to write, to look back." Miller said the blog she started during cancer treatment, and the reader feedback she received from the e-book that followed, in-part served as the new book's starting point. To fill in more details, she spent time interviewing her parents and family, gaining new perspectives in her career from a time when she was hyper-focused on competition. Miller's focus now centers on her two children and the business she founded with her husband, Shannon Miller Lifestyle. "We started [the business] before my diagnosis, and being a [cancer] survivor reinforced our focus on health," said Miller. The company presents kid fitness awareness programs aimed at combating childhood obesity, mostly in the local Jacksonville community. Her writing aside, my take on Miller's work now is that she is all about the present and future in lieu of often looking back on her Olympic career. She often came back to parenting and juggling the many balls of running a business during the discussion. When asked about her days competing in Atlanta, Miller said although she travels through the city often and has friends in town, her main memories are from 1996 Games-time and during two reunions with fellow Magnificent Seven members. before the full-size statue was installed in a park beside the main public library. Miller also makes it to Edmond from time to time, most recently while in Oklahoma to promote the book, which I enjoyed reading on several fronts. In addition to "filling in the blanks" on Miller's career and work between the Olympiads in which she competed, I enjoyed learning more about Miller's athlete:coach relationship with Steve Nunno, and the bonds she forged with several fellow athletes and supporters. In the book, Miller and co-author Danny Peary, a sports writer with extensive film writing credentials, did a nice job weaving precise gymnastics results and stats with the gymnast's vivid recollections -- or at least her memories of critical moments from several competitive years. 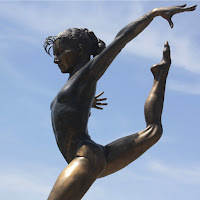 Following a detailed section about winning the team gold in Atlanta, at the start of Chapter 27, Miller takes readers behind the scenes of her first golden evening of the 1996 Games. "That night there was a whirlwind of activity that ended with a late-night party at Planet Hollywood. But in the back of my mind I heard Steve's words, "It's not over." Before leaving the Georgia Dome, I spent time with him and Peggy [Liddick], who were proud and congratulatory by also squeezed a few corrections into our conversation. It would be years before I truly understood the impact we had on the lives of others." Miller follows up this team high with descriptions of the individual event struggles that followed, concluding on a fortunate higher note with her individual gold medal on the balance beam and score of 9.862. Later in the book, many of the challenges and triumphs of Olympic and other international competitions helped Miller find her internal voice to beat cancer, and though the reading of Miller's gymnastics career injuries (nastiest: a dislocated shoulder) and chemotherapy treatments made me cringe a few times, I appreciated Miller sharing the internal monologue that helped her find inspiration from within to keep moving forward in spite of extreme pain, exhaustion and illness. 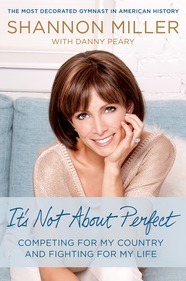 Like the title suggests, "It's Not About Perfect" isn't, but due only to minor faults. In a technical points sense, the copy editors missed a grammar item on page 103, with Miller "sneaking peaks" at Svetlana Boginskaya" during competitions. This error of peeks certainly piqued my interest. The other slight deduction came through omission of an element in Miller's game of life. Though I understand the myriad reasons -- including likely non-disclosures or other legal terms of divorce settlements, not to mention the topic being as personal or even more personal than recovering from cancer -- it was surprising Miller did not delve more into struggles from her first marriage and what she learned during this challenging period of her young adult years. Readers learn about the celebrity appearances and higher ed work in Oklahoma and later Boston, where Miller may prove helpful for the 2024 Olympic bid (when and if they bid committee engages her as they should), but readers don't find much about the difficult choices made that ultimately ended a marriage. Though Miller's book writing goal was not to educate younger Olympic champions on the perks and perils of living in the spotlight, and I "get it" why this was left out (except for a handful of mentions), the relationship regrets might have been helpful for a latter gymnasts now tumbling through post-Games choices. I also thought Miller's readers who may be struggling with a bad marriage might find words of inspiration. Not a major deduction but missed opportunity to score higher. Overall the book is an excellent read earning a 9.85 from this blogger. Given Peary's film background, it won't surprise me when and if "It's Not About Perfect" eventually turns into a screenplay. Miller's story as the most accomplished American gymnast and cancer survivor would make for a compelling silver screen version after we see what evolves as Miller's next big accomplishments. Until then, I highly recommend the text version of "It's Not About Perfect" not only for Olympic fans but also for fans of living one's life to its full potential.